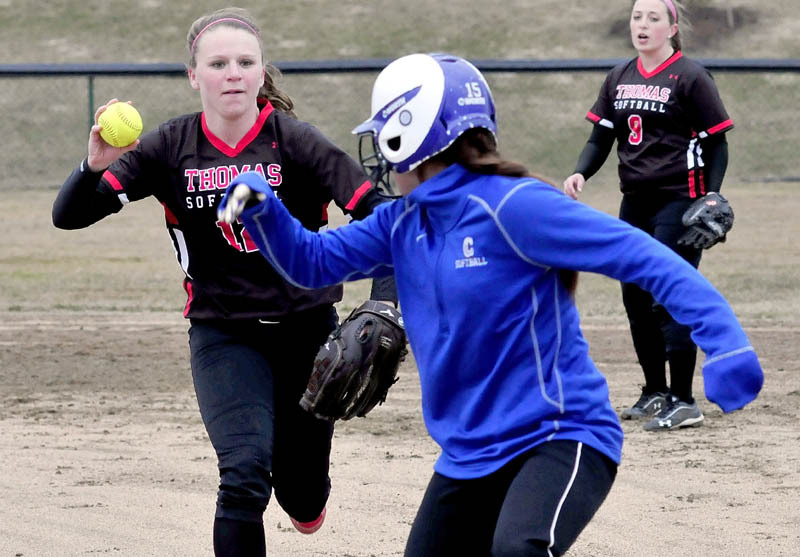 WATERVILLE -- Colby College's eighth softball win of the season was, just like its eighth win last year, a mercy rule win over Thomas. WATERVILLE — Colby College’s eighth softball win of the season was, just like its eighth win last year, a mercy rule win over Thomas. The difference is that Colby is 14 games into the season, and last year’s eighth win came in Game 24. Colby is clearly improved this spring, and while Thomas probably is as well, the Terriers were unable to show that Wednesday afternoon. Colby used a two-hitter from Lauren Becker and a powerful offense to take a 10-0 victory at Thomas College. Kelsey Crowe, Thomas’ No. 1 pitcher, is injured, and the Terriers had a North Atlantic Conference doubleheader Tuesday and another schedule for today. Thomas (3-18) went with McKayla Gastia and Taylor Bergeron in the circle and coach Terry Parlin subbed liberally. Becker, senior lefty, struck out four and left most of the other hitters tapping ground balls or easy flies. Janelle Ciomei singled in the first inning, Alyssa Eugley crushed a double to left-center in the third, and Crissy Cunningham drew a nine-pitch walk in the fifth, but those were the only baserunners for the Terriers. “She had a great outing today — mixed well and hit her spots, and controlled the game,” Colby coach Kristina Katori said. Colby (8-6) went up 1-0 in the second when Erica Pulford got in a rundown between first and second so Tori Sansone could score from third, then swelled that lead to 5-0 in the third inning. Sansone ended up 3 for 3 on the day with two doubles, and Brianne Wheeler and Katherine Zafirson each added a pair of hits. As a testament to Colby’s depth, Wheeler has the second-lowest batting average among Colby’s regulars, but is still hitting .275 with 13 RBIs in 14 games. 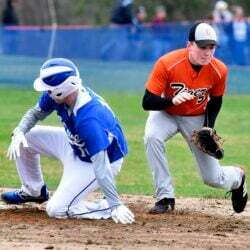 Thomas has a doubleheader at the University of Maine at Farmington today, then has home doubleheaders with Castleton and Green Mountain this weekend. Colby has three games with Bowdoin this weekend.